"Play the classic game of Tetris." Are you In the mood for some classic arcade fun! Do you remember the game of Tetris? It is a beautiful yet addictive game that will have you playing for hours to get that high score. This version of Tetris works on most versions of Windows so even some of you millennium players can join in on the fun too. It's fun for you, all your friends, and family. Even kids can get into it. After all that is the best time to start playing it. 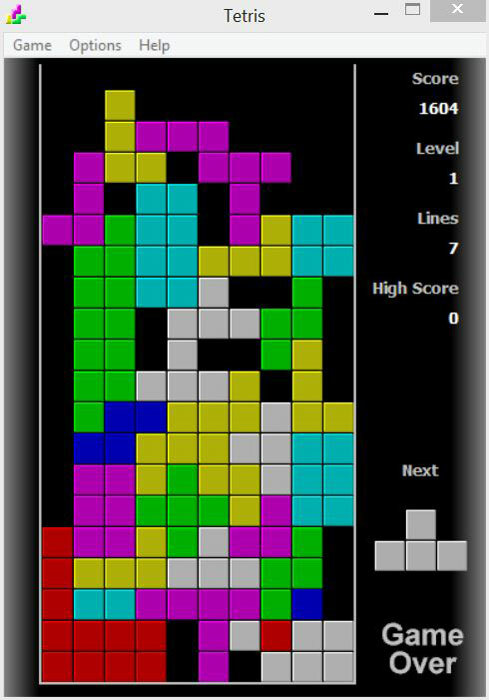 Tetris is a classic moving puzzle game where blocks are, initially, slowly dropped from the top of the interface. A user can change the direction of the block, move it side to side, change the piece all together, speed up the block's decent, or make it drop instantly into place. The object of the game is to not allow the pieces to reach the top. This can be done by grouping the pieces together in a way that they will eventually form a complete horizontal line across the interface. A complete line will cause the blocks to disappear creating more space for more blocks. Be careful though; as the game goes on, you will level up. This causes the blocks to move faster forcing you to think and react faster. Warning: As I mentioned above Tetris is a very addictive game and should only be played when your priorities have been taken care of. Or they won't be. At all. Don't get caught on the job!